Our mild Fall and Winter weather allows for a Fall garden, but it’s often a “gamble” due to sporadic cold snaps — like the one we had for Thanksgiving (with lows in the upper 20’s and highs in the upper 40’s to low 50’s). This year, due to perfect conditions for growth, the tomato bushes were filled with green tomatoes the day of the first freeze for winter. On one hand, there are a number of ways to prepare green tomatoes (a few examples given in the related articles at the end of this post). On the other hand, fresh tomatoes in the winter are a treat! Here are a few hints for storing and ripening green tomatoes. 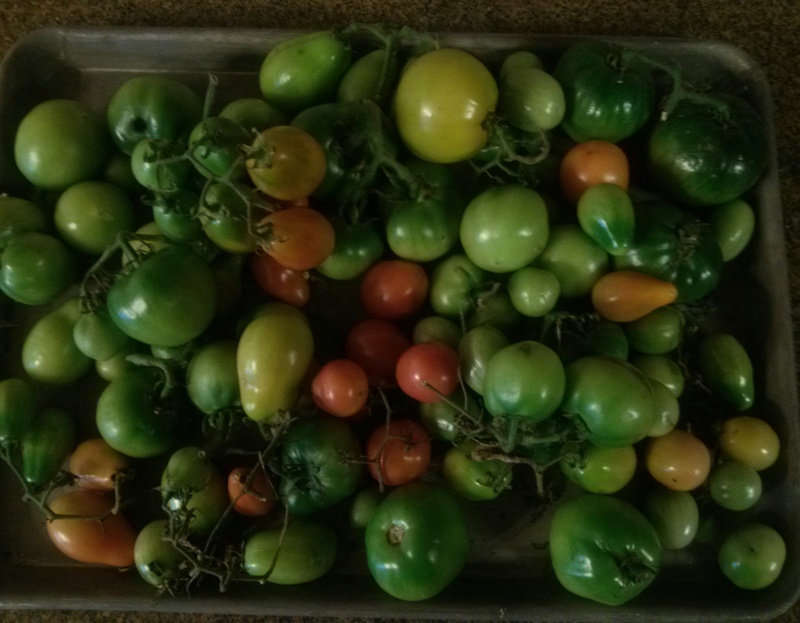 For slower ripening—up to 10 weeks—place the tomatoes on a cookie sheet and set them on a counter (open to the air). I prefer to leave the tomatoes out in the open, my mom and sister like to put them in a kitchen window (that works just fine, as well). Some gardeners pull the entire plant and allow the tomatoes to ripen while attached to the plant — I just keep the stems attached to the various tomato clusters (see picture).